New details have emerged about the criminal history of the Black Lives Matter activist who was arrested in April and charged with pimping a 17-year-old girl from a Maryland motel room. Charles Wade was released from jail in Austin, Tex. on Aug. 10, 2014 after being charged with making false statements in order to obtain credit. A 42-page police report obtained by The Daily Caller shows that Wade sold a stolen bicycle to a pawn shop on April 21 of that year. 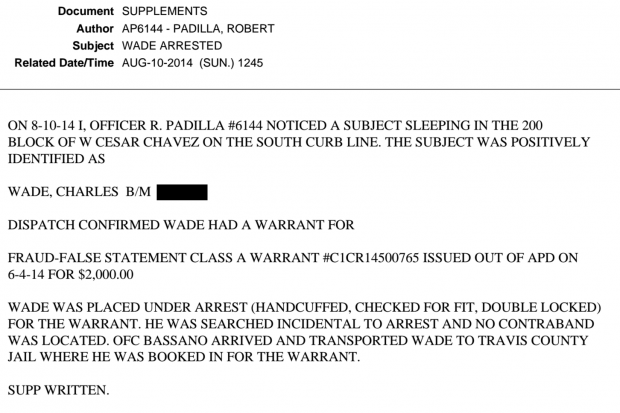 He was arrested while sleeping on an Austin street and found with two passports, one of which belonged to another man. Brown was shot by Ferguson police officer Darren Wilson on Aug. 9, 2014. The 18-year-old assaulted Wilson during an exchange in the middle of a street in his neighborhood. Minutes before the encounter, Brown had stolen cigars from a nearby convenience store and manhandled the storeowner. Wade, who had previously worked as a stylist for Beyonce Knowles’ sister, Solange, founded Operation Help or Hush, which he has claimed was devoted to providing food, shelter and other resources to activists in the St. Louis area. He was featured in numerous national news articles. The Washington Post covered his activist work breathlessly. Wade is currently awaiting trial on charges that he trafficked the 17-year-old girl. A College Park, Md. undercover police detective arrested Wade on April 25 after responding to a backpage.com ad for someone who claimed to be 23 years old. The police report from that incident states that Wade was the person communicating with the detective. The former activist has denied that he is a pimp claiming that he is a victim of being too trusting of the alleged victim. TheDC also reported that Wade’s organization, Operation Help or Hush, was not all it appeared to be. The activist reportedly raised tens or hundreds of thousands of dollars for the group, which he failed to properly register as a charity. Wade was sued for failing to pay a St. Louis landlord $10,000 in rent last year. Wade made numerous false accusation during the case, such as that he settled the suit and paid his bill. A lawyer for the landlord told TheDC that those claims were false. Wade was arrested earlier this year in Miami and charged with grand theft in the 3rd degree. He entered a deferred prosecution program, which requires him to keep out of trouble in order to stay out of jail.